While several studies have reported the outcome of tibial nonunion management using various techniques, few have investigated the factors that might influence this outcome and predispose to treatment failure. This study aims to identify factors that complicate the management of tibial nonunions and are associated with failure of treatment. We performed a retrospective review of all patients with uninfected tibial nonunions that were treated according to our tibial nonunion treatment algorithm between January 2010 and December 2014 [Figure 1]. The ethical approval was obtained from the Institutional Ethics Committee before commencement of the study. Eligible patients were identified from a prospectively collected database. Patients were excluded if they did not complete the intended treatment process. Nonunions were defined as fractures older than 6 months and deemed unlikely to unite without further intervention.,, Screening for potential infection consisted of a detailed history to exclude any previous wound drainage, sinus formation, or treatment for infection of the nonunion site. This was supplemented with clinical and laboratory evaluation that consisted of complete blood count, erythrocyte sedimentation rate, and C-reactive protein levels. Nonunions were classified according to radiographic appearance on preoperative radiographs. Hypertrophic nonunion demonstrated ample callus formation with an elephant's foot or horse's hoof appearance. Atrophic nonunions showed no callus formation or periosteal reaction while minimal callus formation designated oligotrophic nonunions. Nonunions were further classified as stiff if <7° of motion was possible at the nonunion site and as mobile if more motion than this was possible. The motion was assessed preoperatively and then confirmed intraoperatively following fibula osteotomy. True pseudoarthroses were defined as nonunions that appear hypertrophic on radiographic assessment but are mobile clinically and generally not painful on manipulation. These cases have bone ends covered in cartilage and a pseudo capsule that can even produce a synovial fluid-like liquid as opposed to the generally seen fibrous tissue that interposes hypertrophic nonunions. Complex reconstruction was defined as any patient that required repeat treatment or unplanned additional surgeries to achieve union. Satisfactory alignment after the union was defined as <5° malalignment in any plane. Treatment failure was defined as the inability to achieve union. A standard physical, laboratory and radiographic evaluation were performed on all patients as per protocol. Any modifiable risk factors that were identified were optimized before surgical intervention. These included encouragement to stop smoking and moderate alcohol intake, optimal glycemic control in diabetics, and the commencement of highly active antiretroviral therapy (HAART) for human immunodeficiency virus (HIV) positive patients with low cluster of differentiation 4 (CD4) counts. Partial fibula resection was performed in all cases at the time of the index procedure. Resection was performed under tourniquet control and at the level of the fibular deformity if present. Direct surgical approach between the peroneal and soleus muscles was made. The fibula was exposed by subperiosteal dissection, and a small oscillating saw was used to resect approximately 10 mm of fibula to prevent early fibular consolidation. Fascia and skin were closed in layers over a drain. The tourniquet was deflated for the remainder of the operation. Mobile atrophic and mobile oligotrophic nonunions were stabilized with Ilizarov-type circular external fixation. Frame application proceeded in a stepwise approach starting with proximal and distal reference wires, followed by gradual nonunion reduction as fixation is added toward the two middle rings of the frame. Frames were applied in a hybrid method, using a combination of tensioned fine wires, and maximum two hydroxyapatite-coated half pins. Once mechanical alignment and stable fixation were achieved, the nonunion site was compressed manually by adjusting the distance between the proximal and distal ring blocks. The nonunion site was not routinely exposed or debrided, and the addition of iliac crest autograft was only considered if the nonunion site had a diameter <50% of the normal bone diameter. Stiff hypertrophic nonunions were treated with closed gradual distraction through the use of hexapod external fixators. These were applied using the “rings first” method, and the nonunion site was left undisturbed. No tibial osteotomy or bone graft procedures were performed. After postoperative radiographic evaluation, correction program was generated through the online software, and distraction was effected at a rate of 1 mm/day at the apex of deformity. Where no limb length discrepancy existed, a minimum of 3 mm distraction was performed. True pseudarthroses were treated with resection of the pseudarthrosis, followed by bone transport with standard “transport frame” constructs. These frames consisted of ring blocks proximal and distal to a fifth transport ring. The ring blocks were designed in such a way as to allow a metaphyseal osteotomy to generate a bony transport segment. After latency period of 7–10 days, bone transport was commenced at a rate of 0.25 mm four times per day. A formal docking procedure in the form of an autograft was performed for all bone transport cases. Functional rehabilitation was encouraged with the assistance of a physiotherapist. This entailed early joint mobilization and weight bearing followed by normalization of gait pattern and functional use. Pin track care was according to our standard protocol that encompasses a meticulous intraoperative insertion technique and a rigorous postoperative pin care regime that included twice daily cleaning with an alcoholic solution of chlorhexidine. Outpatient follow-up was scheduled at two weekly intervals until a robust rehabilitation routine was established. Thereafter, the follow-up was increased to four weekly intervals. Fixator removal was considered once tricortical consolidation was seen. At this juncture, a staged “trial of union” protocol was initiated. First, the external fixator was completely dynamized, and the nonunion site stressed manually. If this did not cause any pain or deformity, the patient was allowed to weight bear. If the patient was able to walk without pain, he was allowed to return home with a fully dynamized frame and encouraged to mobilize full weight bearing for a period of 2 weeks. Repeat radiographs at follow-up were compared with radiographs from 2 weeks prior. If no deformity occurred during this trial period union was confirmed, and the external fixator was removed. All patients were followed-up clinically and radiologically for a minimum of 3 months after frame removal. Any changes in angulation from the previous visits were identified as a failure of treatment. Treatment failures were retreated according to the same tibial nonunion treatment algorithm. Statistical analysis was performed using IBM SPSS Statistics for Windows version 22 (IBM Corp., Armonk, New York, USA). Bivariate associations were tested for categorical predictors using Pearson's Chi-square tests, Student's t-test, and Mann–Whitney tests. Where appropriate, multiple logistic regression was used to adjust for confounding. Odds ratios and 95% confidence intervals (CIs) were reported. A backward stepwise method was used to arrive at the final model with entry and exit probabilities set at 0.05 and 0.1, respectively. We identified 86 consecutive patients with uninfected tibial nonunions that were treated according to our tibial nonunion treatment algorithm [Figure 2]. Two patients were excluded from the study. These included a 33-year-old male and a 44-year-old female both who died of systemic complications of chronic disease. Both these patients were HIV positive and developed nonunion following open fractures. Eighty-four patients with a mean follow-up of 12.2 ± 7.5 months were included in the analysis [Table 1]. The study population consisted of 65 men and 19 women with a mean age were 36.5 years (range 5–68 years). Neither gender (P = 0.506 and P = 0.583) nor age (P = 0.548 and P = 0.694) was associated with complex reconstruction or treatment failure [Table 1]. Open fractures were the initial injury in 61 patients. Five patients had tibia fractures following gunshots. The remaining eighteen patients had closed fractures. 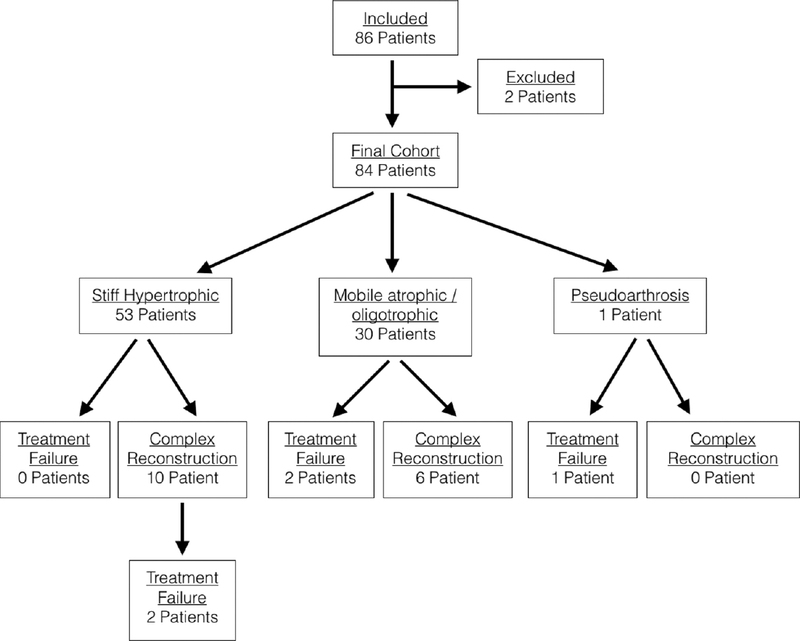 Fifty-four patients had their initial injuries definitively treated by external fixation. These consisted of 41 monolateral and 13 circular external fixators. Twenty patients were treated by closed manipulation and cast immobilization. Ten patients had internal fixation, including five intramedullary nails and five plate and screws. The initial injury was not associated with complex reconstruction (P = 0.866) or treatment failure (P = 0.055). The choice of treatment for the initial injury was also not associated with the need for complex reconstruction (P = 0.239) or treatment failure (P = 0.055). Duration of nonunion ranged from 6 to 120 months since the initial injury, with a mean of 19.8 months, and the time from injury to nonunion treatment was associated with both complex reconstructions (P < 0.001) and treatment failure (P = 0.003). Nonunions were classified as stiff hypertrophic in 53 patients, mobile atrophic/oligotrophic in 30 patients, and a true pseudarthrosis in 1 patient. Neither the radiographic appearance (P = 0.062 and P = 0.862) nor the nonunion site mobility (P = 0.956 and P = 0.353) was associated with complex reconstruction or treatment failure. Comorbidities were identified in 43 patients (51.2%). Two patients were diabetic. Diabetes was not associated with complex reconstruction (P > 0.999) or failure (P > 0.999). Thirty-three patients were smokers and six patients admitted to excessive alcohol intake. Both smoking (P = 0.035 and P = 0.008) and alcohol use (P = 0.011 and P = 0.039) was associated with complex reconstruction and treatment failure. Eighteen patients were HIV-positive (21.4%) Thirteen HIV positive patients with a mean CD4 count of 570 cells/mm 3 (range 124–1056) were on HAART treatment while the remaining five patients with a mean CD4 count of 496 cells/mm 3 (range 433–628) were treatment naive. 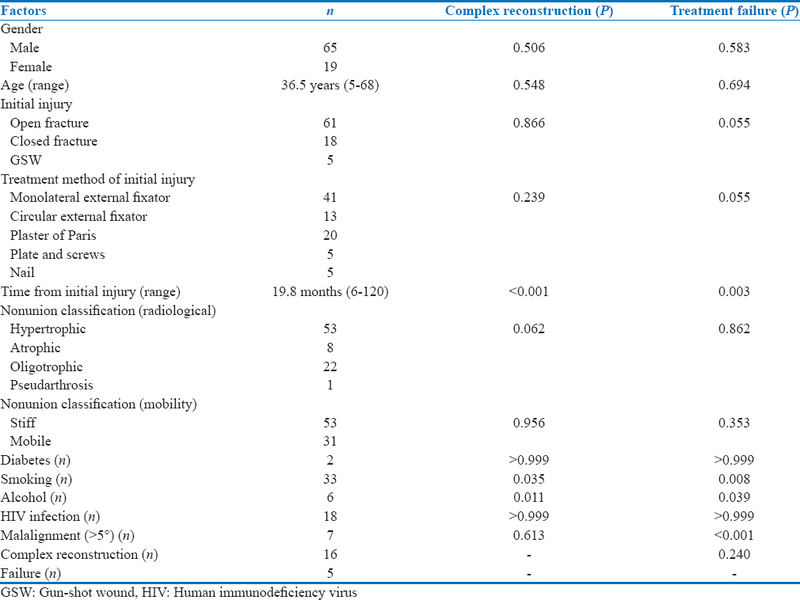 HIV infection was not associated with complex reconstruction (P > 0.999) or treatment failure (P > 0.999). Malalignment of 5° or more angulation in any plane was identified in seven patients. This degree of malalignment was associated with treatment failure (P < 0.001) but not with cases defined as complex reconstruction (P = 0.613). Bony union was achieved in 79 out of 84 (94%) tibias. According to our definition, 16 patients had complex reconstructions. Thirteen of these patients were retreated with a second frame. Three patients required unscheduled returns to the theater; two had unplanned auto bone grafting, and the last patient underwent a transverse osteotomy through an oblique nonunion site to stimulate healing. Two of the complex reconstructions ultimately failed to achieve union. A total of five patients had failure of treatment. Complex reconstruction was not associated with increased risk of treatment failure (P = 0.240). Multiple logistic regression analysis identified alcohol intake (odds radio [OR] 8.7, 95% CI 1.2–65.7, P = 0.036) and time from injury to tibial nonunion management (OR 1.06, 95% CI 1.02–1.18, P = 0.005) as the only significant factors to predispose to requiring complex reconstruction after adjustment for confounding. The aim of this study was to identify factors associated with increased complexity and treatment failure of tibial nonunions. Although many of the findings of this study may appear obvious, no previous study has been able to demonstrate this to date. Delays in nonunion management contribute to the morbidity associated with these conditions. The use of temporal systems to define nonunions is greatly responsible for these delays as treating physicians often wait the mandatory 6–9 months before designating a fracture as a nonunion., Prolonged periods of inability to work can lead to financial hardship, which combined with chronic pain and narcotic dependency places significant psychological stress on patients and their families., It is also during this period that most of the muscle atrophy, joint contracture, osteopenia, and complex regional pain syndrome develop that all add to the complexity of nonunion management. The mean time from initial injury to referral for nonunion management in the current series was 23 months (range 7–114), and this delay had a significant association with both the complexity of reconstruction (P < 0.001) and treatment failure (P < 0.001). Mechanical alignment is fundamentally important during nonunion management. Several authors have emphasized the importance of mechanical alignment during the management of nonunions., The mechanical axis of the tibia is represented by a line that connects the center of the knee joint with the center of the ankle joint while the anatomical axis is represented by a mid-diaphyseal line. These two lines are co-linear in a normally aligned tibia. With angulation of the tibia, a moment is created around the angulation that may result in shear forces across the fracture or nonunion site. This can result in a mechanical environment that in not conducive to bone formation and an inability to achieve union. From the present study, the critical angle that negatively influences tibial nonunion healing appears to be around 5°. Smoking and excessive alcohol intake have direct impacts on bone healing after acute fractures.,,,,,,, The impact of smoking appears to be particularly pronounced in open tibia fractures, but its effect on tibial nonunion management remains to be established., The current study found smoking to be associated with both complexity of nonunion management and failure to achieve union. Although we encourage patients to stop smoking before nonunion management is commenced, the time needed for the negative effects of smoking to dissipate after cessation of smoking is unknown, and this delay should be weighed against the negative affects of delayed nonunion treatment. Recent research has illustrated that excessive alcohol use may have a direct impact on bone healing. Excessive doses of ethanol in the early stages of bone healing inhibit new bone formation, and the newly formed bone lacks mineralization.,,, The current study found excessive alcohol to be associated with both complexities of nonunion management and failure to achieve union. There are several limitations to this study. First, the numbers in certain groups during statistical analysis was low and made further analysis difficult. The study might therefore not have been sufficiently powered to uncover all factors that could potentially influence the outcome of management. The series is also confined to tibial nonunions managed with circular external fixators and may not necessarily be extrapolated to nonunions of other anatomical regions or different treatment methods. From this study, it appears that smoking, alcohol use, malalignment, and time from injury to nonunion management are associated with an increased risk of treatment failure. Smoking, alcohol use, and time from injury also appeared to increase the complexity of management to achieve union. We would urge orthopedic surgeons to refer these patients to reconstructive surgeons as soon as the diagnosis of a tibial nonunion is made. Reconstructive surgeons should also advise their patients on the importance of cessation of smoking and alcohol intake during treatment and note the importance of achieving anatomical alignment after circular external fixator application during the management of tibial nonunions. Paley D. Treatment of tibial nonunion and bone loss with the Ilizarov technique. Instr Course Lect 1990;39:185-97. Kanellopoulos AD, Soucacos PN. 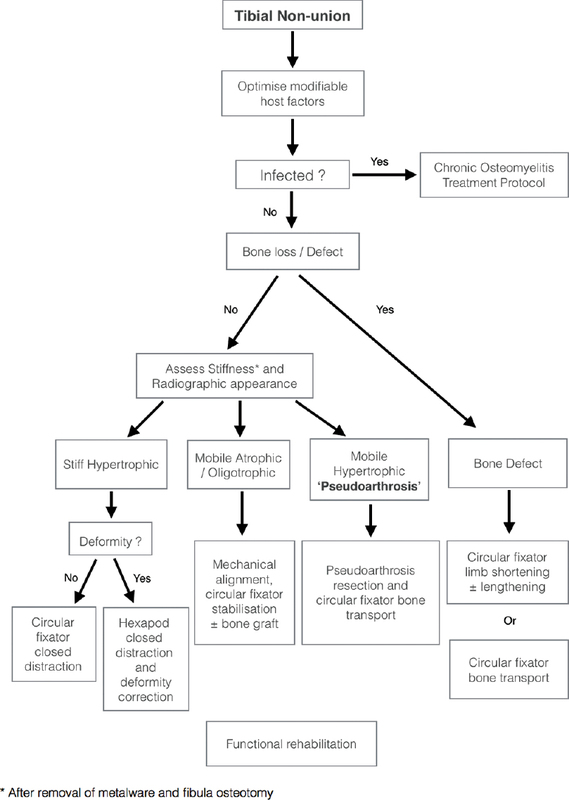 Management of nonunion with distraction osteogenesis. Injury 2006;37 Suppl 1:S51-5. Saleh M. Non-union surgery. Part I. Basic principles of mangement. Int J Orthop Trauma 1992;2:4-18. Bhandari M, Schemitsch E. Clinical advances in the treatment of fracture nonunion: The response to mechanical stimulation. Curr Orthop Pract 2000;11:372-7. Weber BG, Cech O, editors. Pseudarthrosis. Bern, Switzerland: Hans Huber; 1976. Bhandari M, Tornetta P 3rd, Sprague S, Najibi S, Petrisor B, Griffith L, et al. Predictors of reoperation following operative management of fractures of the tibial shaft. J Orthop Trauma 2003;17:353-61. Gaebler C, Berger U, Schandelmaier P, Greitbauer M, Schauwecker HH, Applegate B, et al. Rates and odds ratios for complications in closed and open tibial fractures treated with unreamed, small diameter tibial nails: A multicenter analysis of 467 cases. J Orthop Trauma 2001;15:415-23. Varecka TF, Wiesner LL. The Influence of Acute Hemorrhagic Anemia on Fracture Healing. Presented at Orthopaedics Today Hawaii; 15-18 January, 2012. Dodds RA, Catterall A, Bitensky L, Chayen J. Abnormalities in fracture healing induced by vitamin B6-deficiency in rats. Bone 1986;7:489-95. Cobb TK, Gabrielsen TA, Campbell DC 2nd, Wallrichs SL, Ilstrup DM. Cigarette smoking and nonunion after ankle arthrodesis. Foot Ankle Int 1994;15:64-7. Askew A, Chakkalakal D, Fang X, McGuire M. Delayed fracture healing in alcohol abusers – A preliminary retrospective study. Open Bone J 2011;3:1-5. Harwood P, Newman J, Michael ALR. An update on fracture healing and non-union. Orthop Trauma 2010;24:9-23. Megas P. Classification of non-union. Injury 2005;36 Suppl 4:S30-7. Ferreira N, Mare PH, Marais LC. Circular external fixator application for midshaft tibial fractures: Surgical technique. SA Orthop J 2012;11:39-42. Ferreira N, Marais LC. Prevention and management of external fixator pin track sepsis. Strategies Trauma Limb Reconstr 2012;7:67-72. Antonova E, Le TK, Burge R, Mershon J. Tibia shaft fractures: Costly burden of nonunions. BMC Musculoskelet Disord 2013;14:42. Tay WH, de Steiger R, Richardson M, Gruen R, Balogh ZJ. Health outcomes of delayed union and nonunion of femoral and tibial shaft fractures. Injury 2014;45:1653-8. Gershuni DH. Fracture nonunion. West J Med 1989;150:689-90. Kyrö A, Usenius JP, Aarnio M, Kunnamo I, Avikainen V. Are smokers a risk group for delayed healing of tibial shaft fractures? Ann Chir Gynaecol 1993;82:254-62. Hernigou J, Schuind F. Smoking as a predictor of negative outcome in diaphyseal fracture healing. Int Orthop 2013;37:883-7. Schmitz MA, Finnegan M, Natarajan R, Champine J. Effects of smoking on tibial shaft fracture healing. Clin Orthop Relat Res 1999;365:184-200. Scolaro JA, Schenker ML, Yannascoli S, Baldwin K, Mehta S, Ahn J. Cigarette smoking increases complications following fracture: A systematic review. J Bone Joint Surg Am 2014;96:674-81. Chakkalakal DA. Alcohol-induced bone loss and deficient bone repair. Alcohol Clin Exp Res 2005;29:2077-90. Chakkalakal DA, Novak JR, Fritz ED, Mollner TJ, McVicker DL, Garvin KL, et al. Inhibition of bone repair in a rat model for chronic and excessive alcohol consumption. Alcohol 2005;36:201-14. Adams CI, Keating JF, Court-Brown CM. Cigarette smoking and open tibial fractures. Injury 2001;32:61-5. Harvey EJ, Agel J, Selznick HS, Chapman JR, Henley MB. Deleterious effect of smoking on healing of open tibia-shaft fractures. Am J Orthop (Belle Mead NJ) 2002;31:518-21. Calori GM, Albisetti W, Agus A, Iori S, Tagliabue L. Risk factors contributing to fracture non-unions. Injury 2007;38 Suppl 2:S11-8. Copuroglu C, Calori GM, Giannoudis PV. Fracture non-union: Who is at risk? Injury 2013;44:1379-82.